Bus from Batu Pahat to Ipoh is the most convenient transportation to travel from Batu Pahat to Ipoh. There is no flight and train service available for this route. 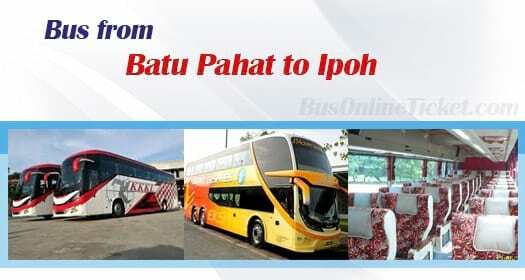 Therefore, direct express bus from Batu Pahat to Ipoh plays an important role to connect the people in the two cities. Many students who are furthering their study in Ipoh Polytechnic School rely heavily on this direct service. KKKL Express and Cepat Express are the only two bus operators offering bus from Batu Pahat to Ipoh. Locals prefer the two bus operators because of their punctuality and secured bus ride experience. There are only 3 daily departures, thus advance online booking is advised. KKKL Express bus departs in the morning 11:00am and evening 10:30pm, whereas Cepat Express bus departs in the evening 8:00apm. The travel time from Batu Pahat to Ipoh by bus takes approximately 7 hours depending on the road traffic condition. The bus fare is reasonably charged in a range of RM 41.80 to RM 50.10 depending on your selection of bus operator. Cepat Express provides child fare at RM 37.60. At least one washroom break will be given during the journey. The pick-up point in Batu Pahat is located at Batu Pahat Bus Terminal. The arrival point in Ipoh is located at Ipoh Aman Jaya Bus Terminal. Passengers arriving at Ipoh Aman Jaya Bus Terminal could take shuttle bus from there to Ipoh town area. Book bus from Batu Pahat to Ipoh bus ticket with BusOnlineTicket.com now or via mobile app which can be downloaded for free on App Store of Google Play. Booking with BusOnlineTicket.com, you can save the hassle of queuing at the ticket counter in bus terminal. Passengers are advised to book bus ticket online with BusOnlineTicket.com in advance especially during peak season.